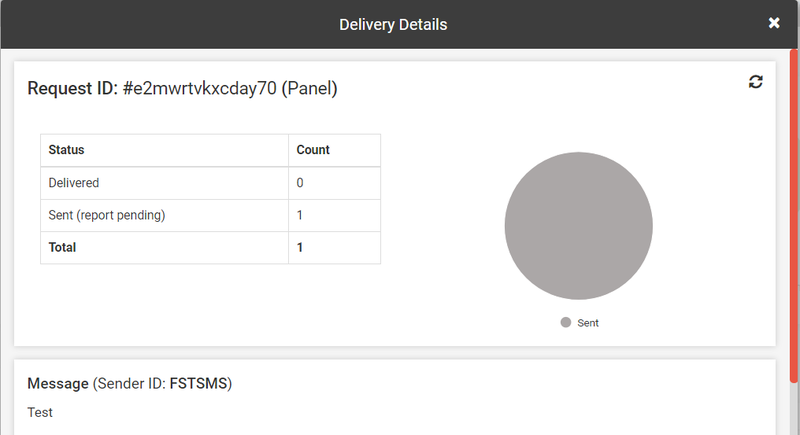 In the Delivery Report section, we can view the details of all the SMS sent by us. All the specific details of the SMS like date and time, status, type, number, etc can be seen. Here we will discuss how to use delivery report and check the record of our sent SMS. As we open the delivery report from the left side of the panel, a graph will be shown. Just above the graph, there is an option of Filter Graph. This means that we can search the sent SMS based on a particular time period which we want to view. In this example it is given as Last 1 week. So the whole 1 week SMS will appear according to the dates. As soon as we click on the circle above the date, number of messages sent by us on that particular date will appear. We can see that no message is sent on 3rd, 4th and 5th August. We have sent 1 message on 6th August. Hence we can see that 6 messages are sent on 7th August and so on. 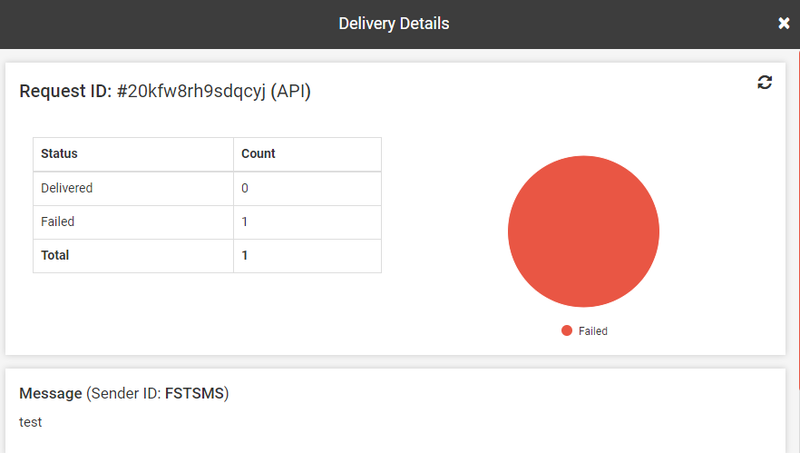 In the pie chart next to the graph SMS status is shown. When we click on the maroon section of the circle, it is showing that out of the total 21 SMS sent, 16 are sent to DND numbers. And 5 SMS are delivered. Note : We don’t charge for SMS sent to DND numbers, Blocked numbers. We debit the charges for Delivered SMS, Failed SMS, Pending SMS and Sent SMS. When we search the Filter Graph options there are different options like Last 1 week, Last 2 week, Last 30 days, Last 6 months and Custom date. Now we have selected Last 2 week option from the Filter Graph. As soon as we press search, after selecting Last 2 week option, graph will get changed according to the Last 2 weeks delivery report. As we can see in the following graph, 2 weeks delivery report are combined together. The delivery report of 2 days are shown together. As we can see in this graph is we have not sent any SMS till 5th August. When we click on the 6th – 7th August time period, we came to know that we have sent 7 messages in total on 6th and 7th August. Similarly when we click on 8th – 9th August, total 14 SMS are sent in that time period. Similarly we can see for Last 30 days and Last 6 months. Let’s now discuss the Custom date option. 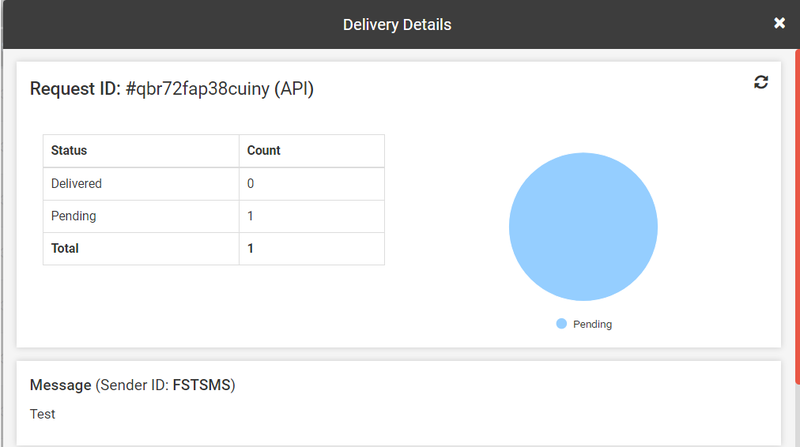 In the Filter Graph when we click on the Custom date, we have to specify the time period of two dates between which we want to view the SMS delivery report. Suppose we want to view SMS delivery report from 7th August to 9th August. We can fill up the custom date and click on search. Then click on the date to view the messages sent on that particular date. Here we want to see the SMS sent on 8th August. It is displaying that we have sent 14 SMS on 8th August. In the same way we can view for 7th or 9th August. This was all about understanding delivery report through the graph. Next we will discuss, the function of the tabs below the graph. As we click on the delivery report option in the right side just below the graph, we will find 3 tabs – Report, Schedule and Export. In the Report tab, 4 other tabs are displayed. All – By default all our sent SMS will appear here. This tab contains 3 options. If we select All, all our sent SMS will be displayed. If we select Panel, all the panel related SMS will be shown and if we choose API, API related SMS will be displayed. All Routes – By default SMS sent by all 3 routes are displayed. In this particular option, SMS will be categorized on the basis of all the 3 routes. If we press promotional, only the promotional SMS sent by us will get displayed. Similarly if we select transactional or quick transactional, the respective SMS of that particular category will be shown. Today – By default today’s delivery report is shown. In this third tab the SMS sent on that particular day will be shown. This tab is divided into today, yesterday, last 1 week, last 2 weeks, last 3 weeks and last 30 days and Custom Date. We can choose the option based on our preference. When we click on the Custom date, we have to specify the time period of two dates between which we want to view the SMS delivery report. When we click on the Custom Date, a window will open as shown below. Type the 2 dates between which we want to view the delivery report. And after entering the dates click on Save button. As you press save, all the SMS which have been sent from 1st August to 5th August will get displayed. 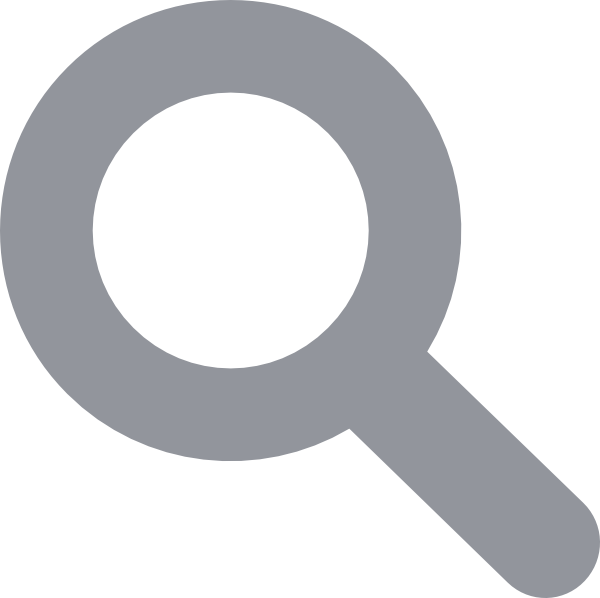 Search Message – In this tab, we can find out any message we are searching for. Now let us check how to see the delivery status of each SMS. When we press the delivery option in the left side of the panel, below the graph, other details are mentioned as well. We have to click on the message to view its status. Click on the SMS whose delivery report we want to view. In this example we want to view the delivery report of first SMS in the list. Click on that message. When we click on that message, a window will get open and all the details of that message will be displayed. As we can see that this message has been sent to 4 numbers. Out of the 4 numbers, 1 is delivered and other 3 are DND that is Do Not Disturb. When we scroll down further, we find that details are given like the receiver’s number, message, message count, status and the delivery time. So in this way we can view the status and other details of the SMS which we have sent. We can download the excel report of a single SMS also by clicking the ‘Download Excel’ option. As we click on that option, an excel file gets downloaded and is shown at the bottom left corner of the screen. Click on the link to open the file. As we open that file containing the delivery report, all sent SMS with the receiver’s name, number and sent time will be displayed. We will discuss what is the meaning of different status in a delivery report and which color denotes which status. The below image is the delivery report of a successfully delivered SMS. It is shown in green color. Unidentified Subscriber, No response from the handset. Number out of coverage area/ Switched Off. The recipient cannot receive incoming messages. Network or Protocol Failure other than the listed. Short Message rejected by MS because of no memory capacity to store the messages. Congestion Encountered at the visited MSC or the SGSN. Recipient MS has no SMS subscription. No allocated IMSI or directory number for the mobile subscriber in the HLR. The PLMN has rejected the short message because the MS failed authentication. All the retries from different operators have been made. We debit the charges of failed SMS because we have to pay the operator. Our system works on submission basis. Means as soon as you push the SMS from our system it will debit the SMS cost, now its on operators when they will deliver or mark that SMS as failed. 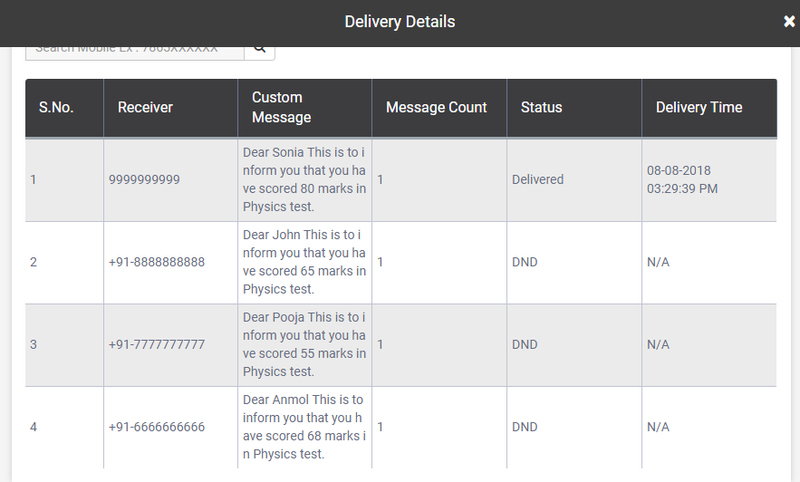 The below image shows the delivery report of an SMS sent to DND number. DND means ‘Do not disturb’. If a person has DND mode activated in their phone, promotional SMS will not get delivered to them. Note: We don’t debit the charges if the SMS is sent to DND numbers from Promotional route. The below image shows the delivery report of a pending SMS which is yet to be sent. The image below shows the delivery report of an SMS which is sent but the delivery report is pending (SMS might get delivered but report is pending). The image below depicts the delivery status of the SMS in which the number is blocked. In Fast2SMS we can block our number if we don’t want to receive SMS. If a person has activated ‘block your number’ feature then the SMS will not get delivered. Note : We don’t charge for the SMS in which the receiver has blocked his or her number. Visit fast2sms.com/dnd to block or unblock your number in Fast2SMS. Note : If you don’t want to receive any SMS from Fast2SMS, you can visit the link above to register your number with the ‘Block your Number’ feature. Next to report is the Schedule tab. In this tab all the SMS which have been scheduled by us to be sent at a later date and time will be displayed. If we want to cancel the scheduled SMS we can do it by going to the delivery report section and then select the schedule tab and then click on the Cancel SMS option. Money charged for that SMS will be refunded in our Fast2SMS wallet. When we press the Cancel SMS option, the following dialog box will appear. Click on Yes Cancel to cancel the scheduled SMS. Note : The date and time of a Scheduled SMS cannot be edited, it can only be canceled. In the Export option next to Schedule tab, we can get a SMS report for the time period which we specify. We need to select the time period between which we want to view the delivery report and then click on the Submit button. In this example we have selected the time period from 1st August to 8th August. Click on Download Excel to download the report. The report might take 5-10 minutes to get generated. Note : The validity period of the delivery report excel file is 3 days. After 3 days, we will not be able to download it. Total request to generate 5 reports can be made at a time. However, we cannot request report generation again if we have a pending list of 3 requests already. Once one of the three gets completed then only we can request for more. A total of 5 requests and 3 pending requests can be completed at a given time.